One of the many benefits of including small grains in crop rotations is improved broadleaf weed control and breaking up weed lifecycles. 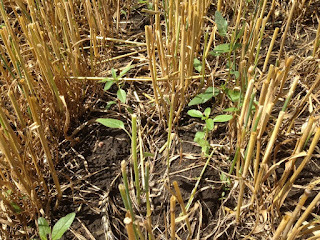 Although freshly harvested small grain fields have a clean look, they often have weeds hiding in the stubble. 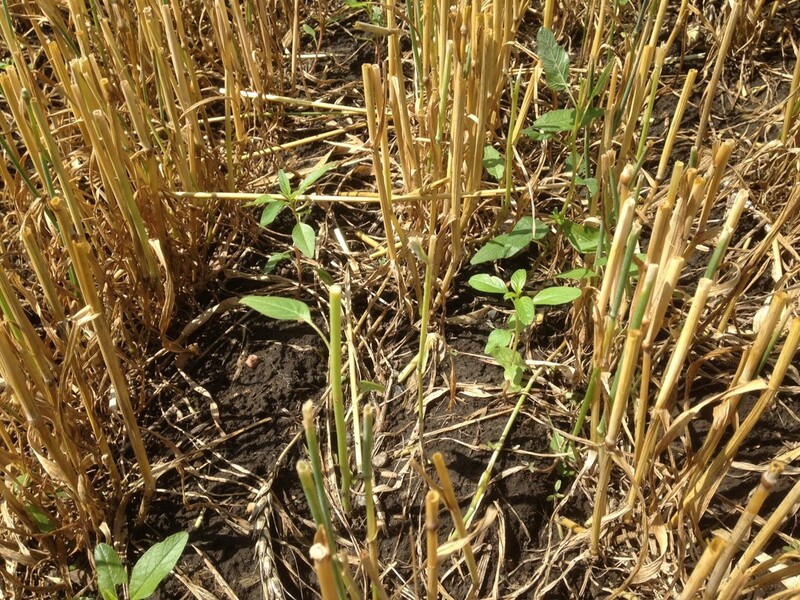 The most prominent weeds in stubble fields are often late-emerging weeds like waterhemp and other pigweed species that emerged after early season herbicide applications were made. Control escaped weeds now to prevent seed production and weed seed bank replenishment. Tillage is a great means of weed control, especially for small weeds. If escaped weeds have not yet produced viable seed, it may be best to perform tillage before they have a chance to. If weeds have already gone to seed, consider delaying tillage until insects, birds, and rodents have a chance to consume some of the weed seeds. Wheat stubble is one of the most attractive habitats for seed predators, because the stubble provides ground cover and weed seeds provide an excellent source of energy. Some weed seeds are consumed at a rate of up to 5% per day, but after tillage, seed predation declines significantly because ground cover is lost and weed seeds are much harder to find when buried in the soil. Unless you are planning to seed a cover crop or graze the small grain stubble, there are numerous reasonably priced herbicide options to control weeds in stubble fields. A timely application of glyphosate (at 0.75 to 1.5 lb. acid equivalent) plus 2, 4-D amine (at 0.75 to 2 lb.) can effectively control broadleaf and grass weeds in the stubble field. Higher rates may be needed to control larger or perennial weeds. If weeds are still small, an application of gramoxone (Paraquat) (at 0.38 to 1 lb.) with 15-20 gallons of water per acre can provide good control, but since gramoxone is a contact herbicide, good coverage and small weeds are essential. Some weeds may have been cut by harvest equipment and are stems with insufficient leaf surface to intercept herbicide application—allowing time for regrowth may improve control. Regardless of the herbicides used to control weeds in stubble fields, check the herbicide label to be aware of any rotational restrictions for next year’s crop. Mowing can provide effective control of broadleaf weeds that are tall enough, or with seed inflorescences above the height of cut. Keep in mind that fields may need to be mowed multiple times to clip off weeds that grow back from axillary buds or to control weeds that don’t germinate until after harvest. Know the biology of the weeds you are trying to control. Waterhemp is a summer annual weed that can germinate from May through August, germinates and emerges from up to ½” depth, and can produce over 250,000 seeds per plant. If waterhemp is prevented from producing seed for 4 years, over 99% of the seed bank can be degraded. However, a few small weed escapes can produce enough seed to replenish the seed bank and negate past weed control success. The pigweed species waterhemp and redroot pigweed are able to produce viable seed within 10 days after pollination. If pigweeds in your fields have just begun pollinating, seed production has likely not yet occurred, and weeds need to be controlled soon to prevent viable seed production. Are your weeds herbicide-resistant? Populations of waterhemp, kochia, common and giant ragweed have developed resistance to multiple herbicide sites of action in Minnesota. Utilizing tillage, mowing, and effective herbicides on weed escapes in stubble fields can be a great time to get a better handle on herbicide-resistant weed populations by preventing seed production and depleting the weed seed bank.